There is no simple definition of metal; however, any chemical element having "metallic properties" or "metal properties" is classed as a metal. Typical properties of metal include luster, good thermal and electrical conductivity, and the capability of being permanently shaped or deformed at room temperature. The variation between the many different properties of metals makes them suitable for many different uses in daily life. Chemical elements lacking these typical metal properties are classed as nonmetals. A few elements, known as metalloids, sometimes behave like a metal and at other times like a nonmetal. Some examples of metalloids are as follows: carbon, phosphorus, silicon, and sulfur. The different properties of metals can be combined by mixing two or more of them together. The resulting substance is called an alloy. Pure elemental metals are often too soft to be of practical use which is why much of metallurgy focuses on formulating useful alloys. Creating an alloy with a specific formula can allow for the creation of a specific metal property or metal properties for a predetermined application. Steel, for example, is a mixture of iron and small amounts of carbon and other elements. Other alloys like brass (copper and zinc) and bronze (copper and tin) are easy to shape and beautiful to look at. Bronze is also used frequently in ship-building because it is resistant to corrosion from sea water. Titanium is much lighter and less dense than steel, but is as strong. When compared to aluminum, although heavier, Titanium is twice as strong. It's also very resistant to corrosion and altogether its metallic properties combine to make an excellent alloy material. Titanium alloys are used in aircraft, ships, and spacecraft, as well as paints, bicycles, and even laptop computers! Copper is a good conductor of electricity and is ductile. Therefore copper is used for electrical cables. The characteristic metal properties of gold and silver are very malleable, ductile and very non-reactive. Gold and silver are used to make intricate jewelry. Gold is especially suitable for this purpose since it does not tarnish. Gold can also be used for oxidation-free electrical connections. Iron and steel are both hard and strong. Therefore they are used to construct bridges and buildings. A disadvantage of using iron is that it tends to rust, and although most steels also rust, they can be formulated to be rust free. Aluminum is a good conductor of heat and is malleable. It is used to make saucepans and foil, and also airplane bodies due to the fact that is very light. Stainless steel or galvanized steel are used where resistance to corrosion is important. Aluminum alloys and magnesium alloys are used for applications where strength and lightness are required. Copper-nickel alloys such as Monel are used in highly corrosive environments and for non-magnetic applications. Nickel-based superalloys like Inconel are used in high temperature applications such as turbochargers, pressure vessels, and heat exchangers. For extremely high temperatures, single crystal alloys are used to minimize creep. 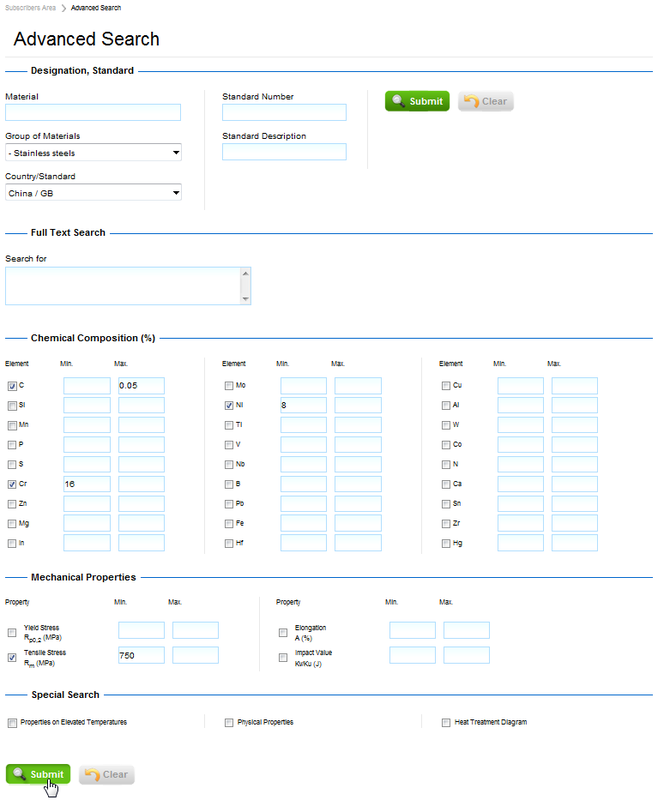 You can quickly and easily search over 15 000 000 metal property records by designation, countries/standards, type, standard number, chemical composition, mechanical properties, other properties or any combination of these criteria. For example, let’s look for a Chinese stainless steel, which needs to have C < 0.05% Cr > 16%, Ni > 8%, tensile stress over 750 MPa. Click Advanced Search from the main window. 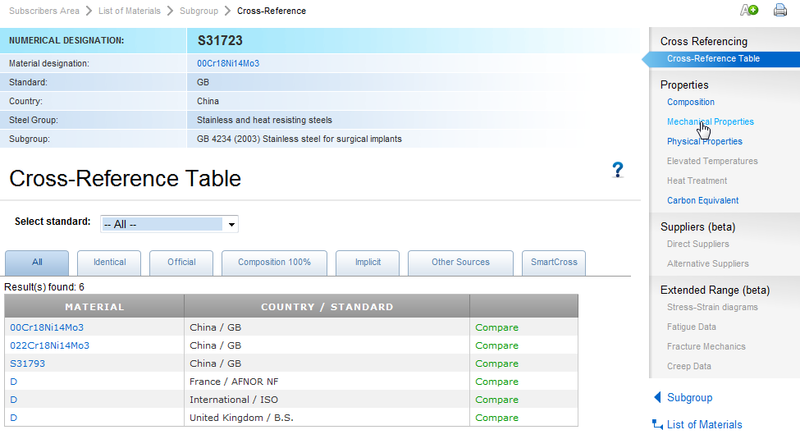 Next, choose China/GB in the Country/Standard list and Stainless Steel in Group of Materials list and enter requested steel properties and alloying elements. The search results screen appears. 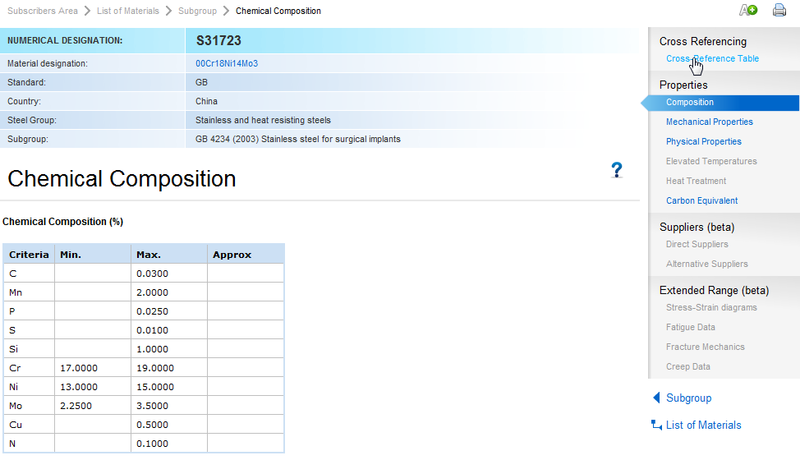 Click on a steel from the list to review its specific metallic properties, in this example S31723 will be selected. After clicking on the material, a list of subgroups appears. In Total Materia, the term “subgroups” refers to standard specifications that define steel properties; in this case the specification GB/T 4234 is selected. 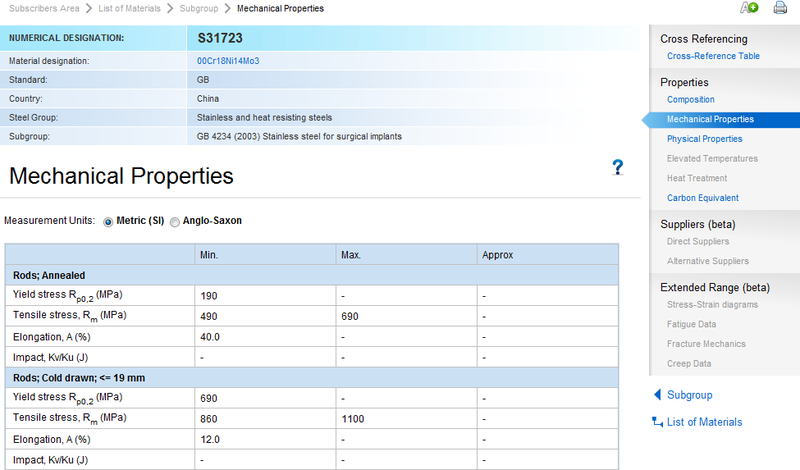 Note that properties defined according to different specifications may differ significantly. Metal properties for this material within the Total Materia Database include composition, cross-reference tables, mechanical properties, physical properties, and even creep and fatigue properties. Click on the examples below to enlarge them.